Tourists on Sunbeam Bridge over Lake Hoan Kiem in central Hanoi Vietnam. Known as the Paris of Asia, Hanoi beckons to millions of tourists each year to Vietnam thanks to its thriving arts scene, colonial architecture, museums, shopping districts, and the scenic natural beauty of over 20 lakes, pagodas, and over 50 Buddhist temples. Hanoi, the capitol of Vietnam, was ranked in the 2015 Traveler’s Choice Awards™ as the #4 destination in the world and is the most affordable of all 25 destinations that made it on the list. Just one look around this city reveals that it has a wide array of things to explore, whether you’re a music lover, a theater buff, a history buff, a shopper, or a foodie. Here is a list of 10 intriguing spots to visit in this romantic, vibrant, and cultured city nestled in the heart of Vietnam. Coming to Hanoi almost always includes a visit to Hoan Kiem Lake. Whether you’re coming here for a morning cup of coffee or tea in one of the cafes, or a relaxing stroll around the tree lined path surrounding the lake, this is definitely a can’t miss spot in Hanoi and is one of the most beautiful parts of the city. While here, you can see the monuments, walk across the Sunbeam Bridge, and enjoy the natural beauty. Locals and visitors come here daily to meet with friends, exercise or watch the tortoises in the lake (which are considered a sacred animal in traditional Vietnamese culture). The vibrant, narrow alleys of Old Quarter (home to the city’s craft guilds) date back over 2,000 years. 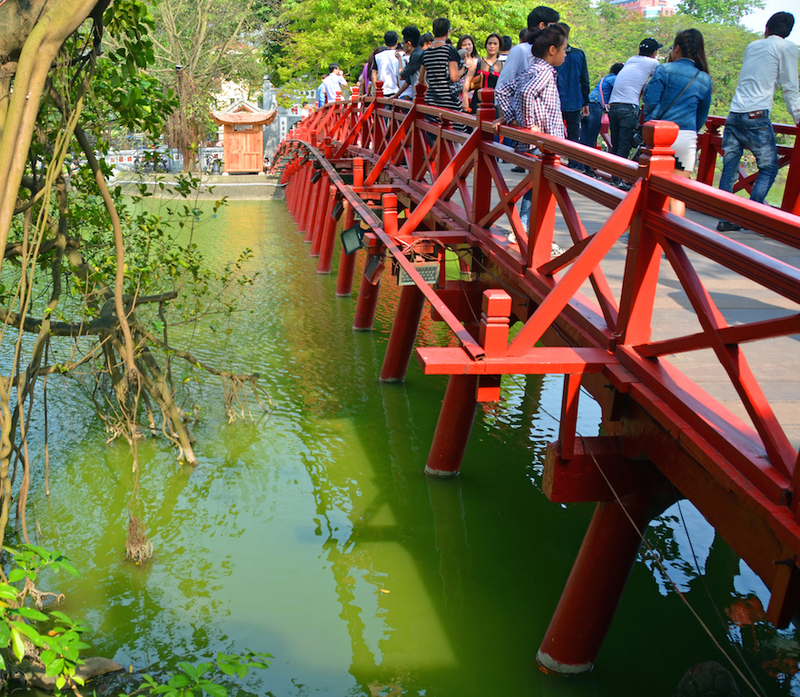 Originally a crocodile-infested swamp, this section of Hanoi was built up over hundreds of years. By the 11th century, it was a celebrated hotspot of workshops and artisans who came from different villages, bringing their own religious practices with them (which is why each street has its own temple). This area of town is also known as 36 Streets, because of the 36 original sections of the area that were the central location for each of the city’s craft guilds. Today, artisans still work in these shops, but you can also find an interesting mix of restaurants, shops, wares, silks, and other products created in Vietnam on each street. This is the burial tomb of Ho Chi Minh (who died in December of 1969), the first president of the Democratic Republic of Vietnam. Many make a pilgrimage to this solemn, many pillared edifice (also known as Chu Tich Mo-Chi-Minh) annually to honor the revered leader. Here, the embalmed remains of Ho Chi Minh (lying with his hands crossed, in a dimly lit and cold stone room) are seen housed behind glass. Visitors are welcome but must be appropriately dressed and remain quiet and respectful when visiting this site. This famous water puppet theater is considered one of the top must-see cultural displays in Hanoi. The puppet shows have special effects like smoke breathing dragons and fireworks, making it all the more interesting. Dramatic live music and exciting theatrical effects bring tales of rural life and legendary ancient tales to life, making it easy to understand the story. Water puppetry is a unique Vietnamese art form going back 1,000 years, with performances taking place in rice paddies, lakes, and rivers throughout the country. The Thang Long Water Puppet Theater is considered the best place to see this unique art form. The original water puppet shows were performed by people from the Red River Delta starting in the eleventh century. Today, performers stand waist deep in river water behind a bamboo screen and control the puppets with long sticks. After the hour-long performance, the screen will rise and you can see the performers. 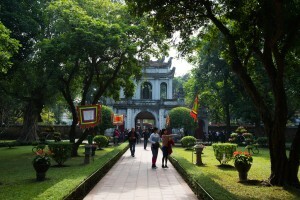 Main entrance gate to the Temple of Literature in Hanoi, Vietnam. 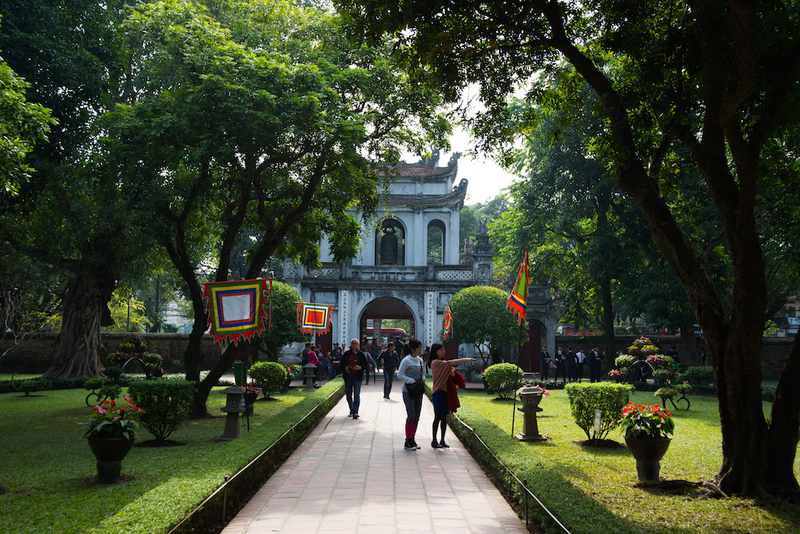 A visit to Hanoi must include a stroll around the buildings and grounds of the Temple of Literature, which was built to honor Confucius (the celebrated Chinese philosopher) during the Ly Dynasty in the year 1070. The red-lacquered Temple of Confucius in the central portion of the complex is just one of the things to see here. You’ll stroll through ornamental gates that are over 900 years old, enjoy finely sculptured gardens that have been maintained by monks, visit ponds, see the National Academy (with its extensive collection of ancient literary texts and learning tools), see bell towers, courtyards, and may even see a human chess game taking place in the fourth courtyard (with brightly costumed participants taking the part of each chess piece). 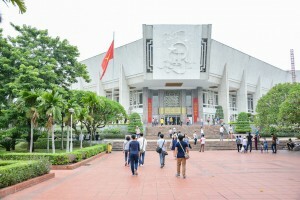 When the Democratic Republic of Vietnam named Ho Chi Minh the first president in 1954, he decided that the Presidential Palace was too ornamental and elaborate for a government official, so he had a humble stilt house built on the grounds of the Presidential Palace. In modest, simplistic style, the house and original furnishings are on display to visitors year round. The Botanical Gardens, with several lakes, a sculpture garden, and fishponds are surrounding the house and are also worth a visit. While here you can see the exterior of the Presidential Palace, although tours are not available. Located on Dong Xuan Street / Market Street, this three-story market is the oldest covered marketplace area in Hanoi. Here you can buy everything from housewares to incense to silk pajamas. If you’re looking to buy typical tourist souvenirs, Hang Hom or Hang Gai might have more what you’re looking for (they cater more to tourists), but a stop at the Dong Xuan Market gives you an authentic Hanoi market experience with all the locally made products front and center. When you go, bear in mind that most stalls will be closed for the lunch hour and early afternoon nap. In the evening, there are more food stalls that open up, making the place a popular destination for locals. Considered one of the best museums in the country, this grand two-story French colonial style building in the capitol city of Vietnam houses a rich display of Vietnamese artifacts dating back to prehistoric days. From engraved drums, to exquisite sculptures, you’ll find a richly detailed rendering of the history of Vietnam at this museum. After browsing the extensive collection of artifacts, you can explore the park gardens behind the building, which include sculptures of sacred dragons and Cham goddesses. Please note that like many other tourist sites in Hanoi, the museum is closed Mondays. Situated in Old Quarter, this historic temple represents the cultural history of the area. It is not the largest temple in Hanoi, but it is one of the oldest and most well kept (it was restored to its original brilliance over 100 years ago). As such, there is a steady stream of visitors to this picturesque and holy site in Old Quarter. The temple is well known for its white horse statue in honor of the magical protecting spirit of a white horse, which showed King Ly Thai To where to build the city walls of Hanoi in the year 1010. Visitors are welcome to this temple but are asked to remain respectful (no loud behavior and immodest clothing, please). With glorious, many-armed Buddha statues galore, this fine art museum is located in the Ba Dinh District, in the same section as popular tourist sites such as Ho Chi Minh’s Stilt House, the Temple of Literature, and One Pillar Pagoda. In fact, this museum is the home of a famous Enlightened Being statue (Bodhisattva) with 1,000 eyes and 1,000 arms. Some artifacts date back to the Stone Age and Bronze Age. Other notable exhibits include an impressive collection of lacquer paintings on the second floor. 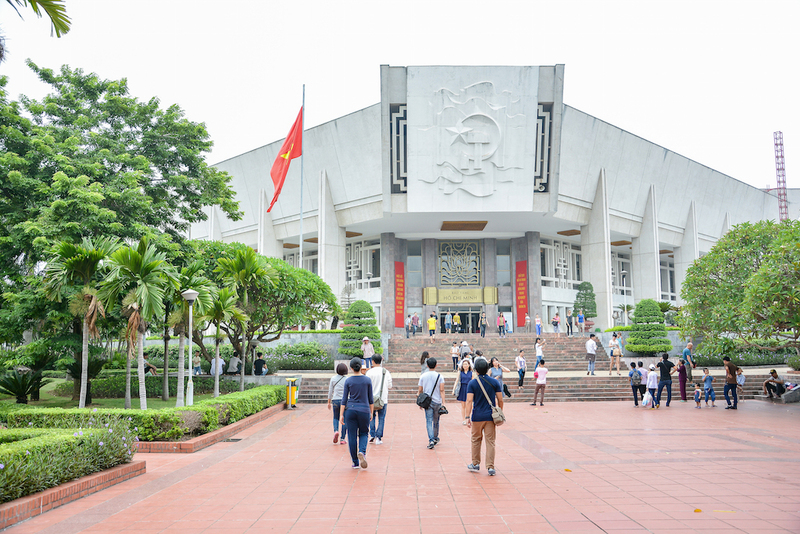 Other top sites to visit in Hanoi include the Ho Chi Minh Museum. These are only a few of the many things to do in Hanoi, Vietnam. There are dozens more places to explore and places to see in this beautiful city. Before you leave for Vietnam, you’ll need your passport, luggage, and your Vietnam Visa. You can apply for a visa today to visit this culturally rich city at Vietnam Visa. You can get approval within 24 hours for a one-month or three-month visit to Vietnam.